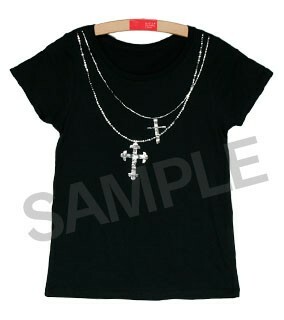 T-shirt featuring the rosary worn by Shiki in "TOGAINU NO CHI!" T-shirt featuring a printed design of the rosary Shiki wears in the game. Super-cool black shirt with silver print design, made in Shiki's image! This t-shirt is size Women's Small. Please confirm size measurements carefully before ordering. We do not accept size exchanges or returns. Originally available at the "Nitro+CHiRAL Labo" limited-time shop.